Lamberts Vitamin B-12 1000µg is a complex substance containing the mineral cobalt at its centre. Principally, it participates in the rapid regeneration of bone marrow and red blood cells. This vitamin was first isolated from the liver in 1948 and is needed for the synthesis of DNA and for normal metabolism of nerve tissues. However in cases of achlorhydia (absence of hydrochloric acid in the stomach) the vitamin may not be extracted from food. Ideal supplement for vegetarians or vegans. Essential for maintaining the functioning of the nervous system. Helps to promote a healthy cardiovascular system. Folic acid, iron and vitamin B12 are all referred to as haematinic factors and are vital for the formation of healthy blood cells. 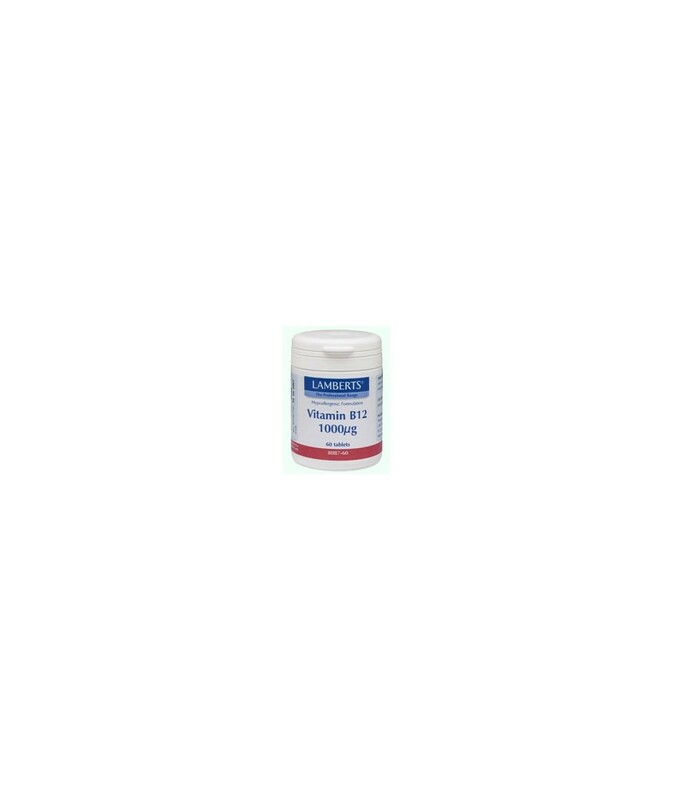 Vitamin B12 is also necessary for myelin sheath production and for a healthy cardiovascular system. Vitamin B12 is found mainly in animal based foodstuffs such as meat, so this supplement is ideal for those whose diet is low in or eliminates this food. Lamberts Vitamin B-12 is not recommended for pregnant or lactating women. Use of this Lamberts supplement requires specialistknowledge. Vitamin B12 100µg. Tableted with: DiCalcium Phosphatre, Cellulose, Silicon Dioxide, Stearic Acid, Magnesium Stearate.